International flights UK - Sao Paulo, Rio de Janeiro - UK. *Details of your internal flights will be detailed in your travel documentation, in your Customer Area, 72h before your departure date. 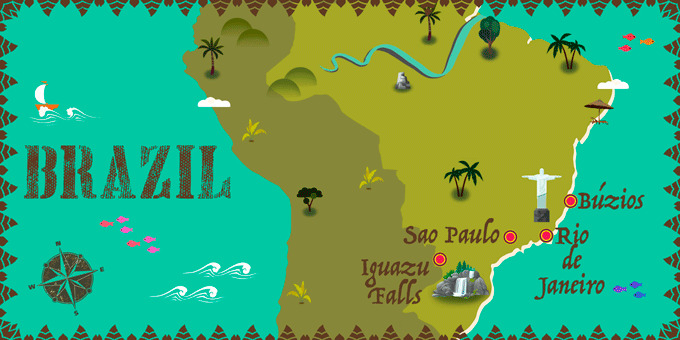 *Optional Excursion to the Argentinian side of the Iguazu Falls: Take the train to the 'Devil's Throat' where a lookout area grants the opportunity to watch the water rush from the river and down an 80 metre (262 feet) high sheer drop. On the way, back from the falls stop at the “Three Borders” where you will see the junction of all three countries where Brazil, Argentina, and Paraguay meet! Price per person: £85. Breakfast at the hotel. Spend the day taking an included city tour of wonderful Rio and Corcovado Mountain, which includes a trip up to the famous Christ the Redeemer statue. Visit the famous Corcovado mountain, one of the Seven Wonders of the Modern World and where you can watch the city from afar and admire the view of Lagoa Rodrigo de Freitas. Christ Redeemer is more than 700m in height and dominates the city's skyline. Admire the iconic Christ the Redeemer; an immense rock statue built by the sculptor Francés Paul Landowski which celebrates the visit of Carioca. Descend from the hills to enjoy a visit to Maracanã and a visit to the Sambódromo, where the Rio Carnival takes place yearly. Soak up the vibrant atmosphere of this lively city. Overnight in Rio de Janeiro. *Optional Excursion to Sugar Loaf Mountain, the Selaron Steps & Metropolitan Cathedral: Enjoy an informative tour of downtown Rio before stopping at the Metropolitan Cathedral, built in a pyramidal form and seat of the Roman Catholic archdiocese in Rio. Next, admire the colourful Selaron steps and head for the neighbourhood of Urca where one of the largest symbols of the city is located: Sugar Loaf Mountain. Travel to the top on a cable car and enjoy the spectacular views of Rio-Niterói Bridge and Corcovado Mountain. Look down on Copacabana beach, the Santa Cruz fortress and several beaches of Niterói and be amazed at the sheer beauty and diversity of the Rio skyline. Price per person: £60. Breakfast at the hotel. Transfer to the airport for a flight back to the UK. Night on board. An adapter with two flat pins is required. No vaccinations are required for travellers from EU countries. You must consult the Brazilian embassy or consulate if you have recently travelled to other countries.